Lucy and Owen meet somewhere between the tenth and eleventh floors of a New York City apartment building, on an elevator rendered useless by a citywide blackout. After they're rescued, they spend a single night together, wandering the darkened streets and marveling at the rare appearance of stars above Manhattan. But once the power is restored, so is reality. 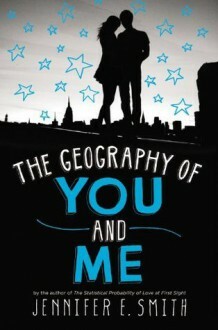 Lucy soon moves to Edinburgh with her parents, while Owen heads out west with his father.Lucy and Owen's relationship plays out across the globe as they stay in touch through postcards, occasional e-mails, and -- finally -- a reunion in the city where they first met.A carefully charted map of a long-distance relationship, Jennifer E. Smith's new novel shows that the center of the world isn't necessarily a place. It can be a person, too. I really liked this book and Lucy and Owen's story. The writing style was so easy to read which is always nice.